“5 Daily Habits” is a scrapbooking idea where you pick out 5 of your personal daily habits that you perform almost every day without giving much thought to, but are really a part of your life and who you are. Think for a minute or two and come up with your own list. You’ll probably have more than 5 habits, so take another minute to narrow your list down to 5 that you think would most define you or stuff you couldn’t do without, or activities that you just gotta perform on a daily basis. A strong black coffee early in the morning? A bag that matches your clothes before you dash out the door? Getting your newspaper from your favorite news vendor? Habits are usually stuff we do each day without much thought. But hey, they make for a meaningful scrapbook page that describes to others, an interesting dimension of you. 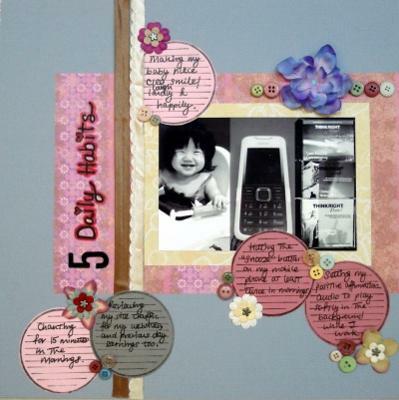 So start digging your daily habits and turn them in for this week’s scrapbooking challenge! Supplies Used: Cardstocks – Bazzill Basics, Colormate and World Win; Patterned papers – Brenda Pinnick Designs by Paper Confections; Clear stamp – Autumn Leaves “Journaling by Katie Pertiet”; Buttons – Autumn Leaves “Foof-a-La”; Flowers; Prima Marketing; Silk flower – from stash; Flower brads – Making Memories; Blue brad – KCK Craft; Ribbon – Satin Bias Tape from Wheel & Anchor; Black pen – Zig Memory System “Millennium”; Black marker – Zig Memory System “Dotta-Riffic”; Red pen – Zig Memory System Fine & Chisel”; Number sticker – American Crafts “Thickers” Vinyl letter stickers; Sketch: Pg 42 of Scrapbook Page Maps: Sketches For Creative Layouts .